Almandine is a deep violet-red garnet that consists of iron aluminium silicate and is used as a gemstone. It is known as a Stone of Tangible Truth. It assists in manifesting a realistic version of the physical world. Its energy helps alleviate worry, panic and fear, and assists in maintaining a calm connection to the present. It allows one to perceive the absolute support of the Universe. Its intellectual properties also make it useful to those exploring the fields of astronomy, astrology, and mathematics. 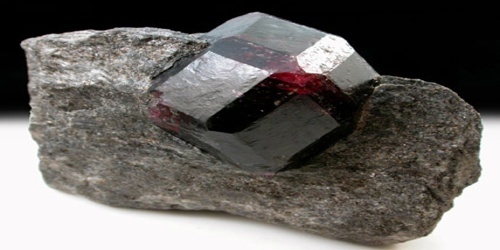 Almandine is one end-member of a mineral solid solution series, with the other end member being the garnet pyrope. The almandine crystal formula is: Fe3Al2(SiO4)3. Magnesium substitutes for the iron with increasingly pyrope-rich composition. It is frequently cut with a convex face, or en cabochon, and is then known as carbuncle. Viewed through the spectroscope in a strong light, it generally shows three characteristic absorption bands. Almandine is the traditional birthstone for the people born in January. It is the zodiac stone of Aquarians. The crusaders used to wear Almandine as a protection stone. In ancient times, Almandine was worn as a guard against poison. 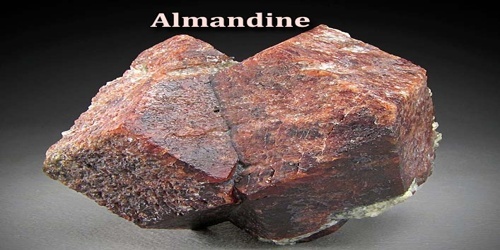 Almandine utilises the energy of fire. It brings activity, enthusiasm, and passion and zeal in the home. 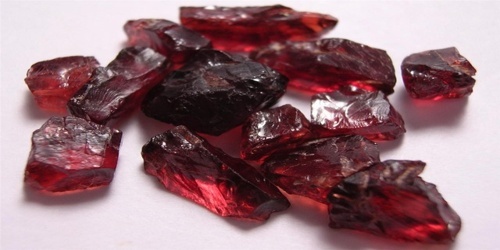 Almandine occurs in large amounts in the rock-strewn gem areas of Sri Lanka. Large deposits of Almandine were also found some years back in Australia. 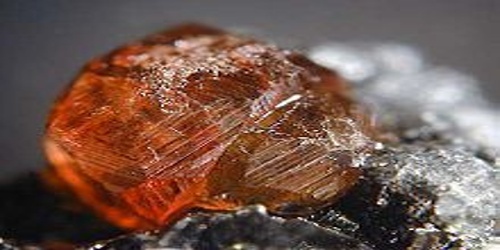 In United States also there are a number of localities that yield Almandine. Its other sources include India, Madagascar, China, and Brazil. It is widely distributed. Fine rhombic dodecahedra occur in the schistose rocks of the Zillertal, in Tyrol, and are sometimes cut and polished. There are very few varieties of Almandine crystals that are see-through or transparent, and light enough to be used in jewellery; however most of the Almandine found is coarse and opaque and is not of gem quality. The healing energy of Almandine cultivates in the wearer the sense of security and safety. It helps in bringing deep love, truth, and genuineness in life. It initiates compassion and charity and opens the higher mind. Almandine has a good hardness of 7.5 to 8.5 on Moh’s scale. Almandine is a strong regenerative healing crystal bringing strength and stamina, and aids circulation and all blood related issues. It is a stone of physical love and relationships, and a spiritual stone of psychic protection. It increases willpower and resistance to all things negative. 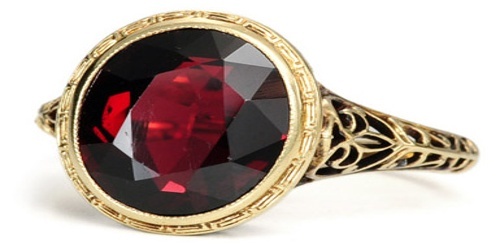 Almandine Garnet ranges in color from light to deep scarlet, dark red, and muted shades of brown.